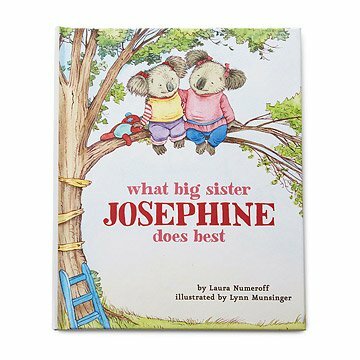 Kids sometimes see the arrival of a new baby in the family as a cause for jealousy, but this charming, customized hardcover book can help those new big sisters see how they fit in the picture. Written by Laura Numeroff, author of If Your Give a Mouse a Cookie, the book explains all the things a big sister can do for their little siblings. Big sis will be delighted to see her name appear on the cover and throughout the story, along with a special dedication message from you on the front page. The book is written as if regaling the new sibling with all the loving things the older child will do. This helps to model positive sibling interaction without feeling preachy, and also provides an opportunity for big sisters to share the book once the little one is old enough to enjoy story time. Click here to check out What Big Brother Does Best. Great book for a new big sister. Got this for my first granddaughter and know she will love it. It was sweet but the story line was too simple for the cost. When we saw this book we knew we had found the perfect birthday present for our soon to be 3 years old granddaughter. Our granddaughter is having a difficult time adjusting to her new baby sister. She thrives on being praised for doing things well so we know this gift is going to help her accept her role as a big sister in a positive way. We were also very pleased we could add our own Happy Birthday message in the book! Best gift idea ever! This book was for my granddaughter. Was very happy with the product. The personalization was a nice touch. I think it will help her understand what being a big sister is like because she is eight now and her mum died when she was only two, so she has been an only child for six years. I wanted to get something for two of my closest friends from high school who both had babies within the last 6 months. They both also have toddlers who are adjusting to having a new baby in the house, so this seemed like the perfect gift. They both love it! A new sibling is to arrive in September and this is a great tool to get positive thoughts for my great granddaughter to avoid jealousy. This was a gift to someone several states away. This was a charming little book and was a hit with the "big sister" to whom it was given. She is two and loves seeing her name throughout the book.The only thing that would have made it better was if there were options to choose from for the gender of the sibling. It can be a little confusing for a toddler to turn pages and one page it shows a big sister to a girl and on another a boy. My Big Sister Loved the book. Big Sisters are and Always will be there for Little Sisters. I Love my Sister so much. I am So Lucky to have the Best Sister in the Whole World!! !